Before Sanders spoke, he was introduced by a series of speakers including three African-Americans: South Carolina State Rep. Terry Alexander (who spoke of Sanders’ life-long commitment to equal justice and opportunity), former Ohio State Senator Nina Turner (who heralded Sanders’ long-time commitment to racial justice and his status as “only one of two white elected officials” who supported Jesse Jackson’s presidential campaign run in 1984), and racial justice activist (and Intercept columnist) Shaun King (who described in detail Sanders’ history as an anti-racist and civil rights activist in the 1960s and his decades-long devotion to issues of racial equality). After Sanders’ speech, MSNBC immediately asked its panel for its reaction. The first person they turned to was Zerlina Maxwell, who the host identified only as an “MSNBC analyst.” What the host omitted, but which Maxwell herself acknowledged, was that she was a paid official for Hillary Clinton’s 2016 campaign against Sanders: that, revealingly, is the first person MSNBC had opine on Sanders’ speech. All one needs to do to prove this is an obvious lie is look at the video of Sanders’ speech – which the MSNBC panel had just done as it allowed Maxwell to deceive its audience this way. Sanders then devoted several minutes to denouncing the inequities, unfairness and destructive effects of America’s criminal justice system and the Drug War, contrasting the severe punishment meted out to low-level marijuana and other small-time offenders to the full-scale protection and even bailout for the Wall Street tycoons who crashed the economy in 2008. His other principal policy focus during that part of the speech was what he regards as the evils of Trump’s immigration policies and the xenophobia that drives it. In sum, Sanders did not just mention race and gender once in his speech before the 23-minute mark Maxwell claimed, but did so repeatedly. It was not only the major theme of the speakers who introduced him but a primary theme of his own speech from the start: both explicitly railing against the evils of “racism, sexism, xenophobia, homophobia, and religious bigotry” and vowing to usher in “social justice and racial justice,” but also launching full-scale, vehement attacks on the policies – inequities in the criminal justice system and immigration abuses – that have as their primary targets racial and religious minorities. 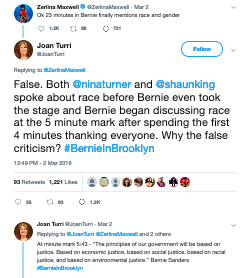 It is, needless to say, perfectly legitimate for MSNBC to devote its airtime to critiquing what Sanders said about race and gender: to claim it’s insufficient or insincerely held or superficial. But what is indisputably unacceptable is for MSNBC to outright lie about Sanders’ speech by stating categorically that “he did not mention race or gender until 23 minutes into the speech.” That is simply a lie, and it’s a lie that would have been instantly recognizable as such to anyone who watched the speech. Despite all this, there is no correction from MSNBC or Maxwell: par for the course for this DNC operation masquerading as a news outlet. Indeed, as is almost always true for MSNBC, all of these pleas that they correct their false claim have been steadfastly ignored – no correction issued – because, as I’ve repeatedly documented, lying about adversaries of the Democratic establishment is not merely tolerated or permitted at MSNBC, but is encouraged and rewarded. That’s why they purposely had the very first person to comment on Sanders’ kick-off campaign speech be a paid Clinton 2016 campaign official highly embittered toward Sanders, and it’s why MSNBC does not correct lies no matter how loudly, clearly, or indisputably you document those lies to them. First, since the falsehood was originally broadcast on MSNBC, the cable network itself should broadcast any correction and an apology for misleading its viewers, not just rely on Maxwell’s Twitter feed. 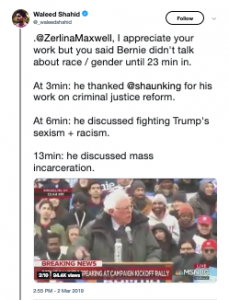 Second, even this “correction” is misleading – actually false – as it claims that there was only one “passing line at 6 minutes” about race and gender that Maxwell somehow “missed”; but as this article documents, there were multiple, explicit instances of Sanders’ mentioning of race and gender, rendering even her attempted correction itself false.